I recently gave a webinar on social media and I thought I would write a bit about it even though I’m pretty tired of talking about social media. But, I think there is something new to say here. The talk stemmed from noticing that so many library campaign committees and librarians running their organizations social media have fallen into the trap of trying to identify the next big platform to use. They’ve joined everything from Snapchat to Pinterest to Facebook in search of some kind of social media nirvana that will solve whatever problem they are trying to solve. I don’t think this is a good use of our time or resources so instead of asking you to join and use more social media platforms, I’m going to ask you to ignore all the social media static and only focus on what we know works (for now). We are going to step away from focusing on being as social as possible, to being as effective as possible. We have seen libraries ineffectually chasing social media as fast as that social media comes and goes. If you remember the clamor to get on to MySpace, Second Life, Friendster, etc… and then next big rush to get onto Pinterest, Goodreads, and G+ you’ll also remember how fast some of those faded away. This is basically the fishing net method of social media marketing. 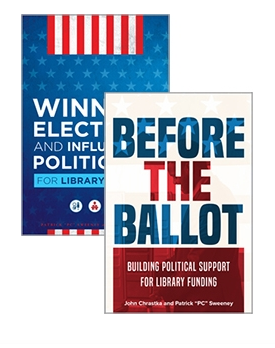 Libraries are throwing the biggest net possible and hoping that they catch something they want and throwing the rest back instead of using the bait that works to get exactly what they want. All of this is largely because we are looking at using these tools backwards. For example, our organizations get on Twitter and then try to figure out their Twitter strategy. But this doesn’t work because there is no such thing as a Twitter strategy. Twitter is a tool to help you achieve a strategy. What is more effective is to ask what the library’s goal is in building a relationship with the community, then figure out how to measure it, then figure out which tools satisfy your requirements and use those. Remember that for an election or advocacy standpoint, our goal is to get our message out to as many people as possible as effectively as possible. 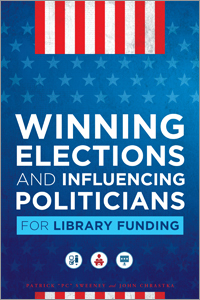 With that in mind, I’m going to argue that the only two online tools that you really need right now to win a library election or advocate for your library are Facebook and Email. These two platforms can be used effectively in conjunction to build the relationships that your campaign is looking for in a more focused and streamlined fashion. These are two complimentary tools with enough depth, scope, and longevity to take the time to invest resources in and they connect with each other in a way that supports both. The most important thing I learned in political advocacy is that its all a numbers game. As of 2013, the only two online tools with a high enough usage to be advantageous are, in fact, Facebook and email. According to a Pew Study, around 85% of Americans have email and around 74% of Americans have Facebook. The next highest user percentage rates are less than 25% of the American Public with Linkedin at just 22%, Pinterest at 21%, and Twitter at 18%. What this means, is that if you capture every Twitter user in your area and win them over with your message and they are all registered voters and they all go out to vote, you’ll still lose the election because that is just 18% of the public. Yet, 58% of Americans report that one of the first things they do in the morning is check their email. So, where do you want to be? A much better strategy would be to go with the tools that you know have enough market saturation to get your message out in a high enough volume to really help you get your message out. Those are email and Facebook. There are some strategic differences in how these two platforms work and how people engage with them, but that will be a post for a later day.